Firebox volume: 3,2 cu. ft. Some of the Osburn 2400’s impressive features include a 3.2 cubic foot firebox; a heating capacity of up to 2,700 square feet; 12.5” of clearance in the firebox, which can accept logs up to 21”; and a burn time of up to 10 hours in slow combustion mode. In addition to its impressive performance, the 2400 is environmentally efficient, with emissions as low as 1.6 g/hour (in medium-high combustion mode. 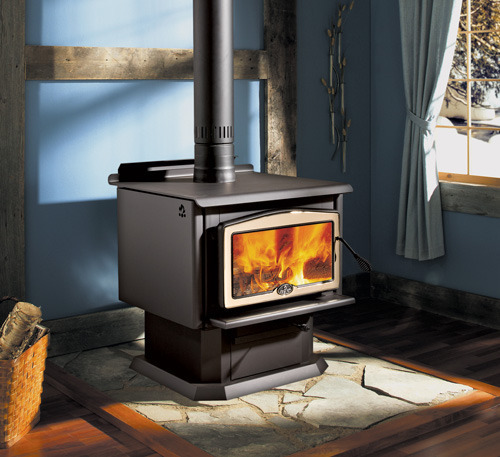 If you’re looking for a large wood stove for your home or weekend cottage, the Osburn 2400 is a perfect choice. Model Number: OB02411 100,000 BTU/h. Heating capacity: 800 to 2,700 sq.ft. Firebox volume: 3,2 cu.ft. Maximum log length: 21″ Adjustable handle Self-cleaning glass system Heavy duty cast iron door Ash drawer with safety lid Mobile home approved Optimum efficiency : 78% Qualifies for the USA tax credit (USA only) Tested by Warnock as per applicable standards (CSA/UL/ULC and/or others).